Onboard Distortion Without a Battery? Low-Voltage Chunk from Diode Distortion! 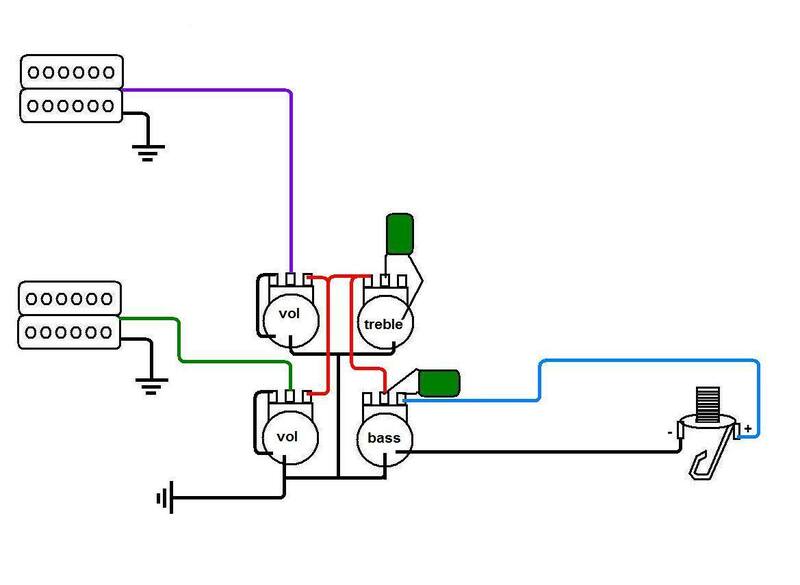 Did you know you can add a simple circuit to your guitar or bass that produces onboard distortion — without using a battery? 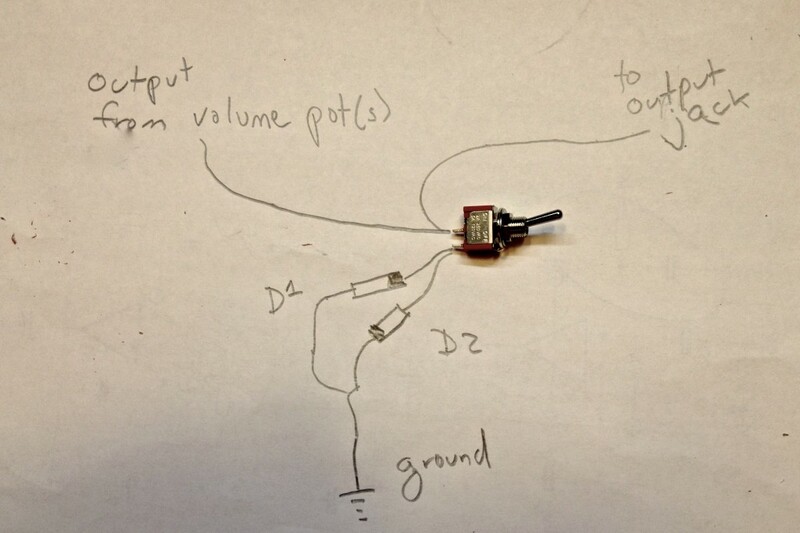 The idea is pretty simple — you attach a pair of diodes to the guitar’s output via a pot or switch. With the diodes connected to ground, you get a fairly nice distortion sound. With the connection to ground broken, you get your regular tones. It’s the same method used to create distortion in a several ’70s distortion pedals, notable the MXR Distortion+ and the DOD 250. My reactions: It’s a pretty cool effect, though the volume drop when engaging the distortion might be an issue. If would be great, however, in any context where you need a crunch sound at restrained levels, like when playing in a stage pit band. It’s not a terribly refined tone, but definitely a usable one. Before recording this demo, I tried a Black Ice in a vintage-voiced Strat. It definitely created a distortion effect, but it’s much more gratifying here with the higher output P-90s and humbuckers. This dual-pickup guitar is wired for two volumes and one tone. The fourth pot adds the Black Ice distortion — that ominous black cube. I rewired the demo guitar — which you may recognize from this post about makeovers for cheapo axes — for two volume knobs and a single tone, freeing up the fourth pot for the Black Ice circuit. But I don’t think I’d repeat this method. Use the low-voltage Schottky diodes specified in the article. Be sure they're oriented in opposite directions — the cathode (banded end) of one diode connects to ground, as does the anode (non-banded end) of the other. Conclusions: Interesting, inexpensive, and possibly useful. Worth a try! 108 comments to Onboard Distortion Without a Battery? Wow that seems like a pretty cool idea!!! What should I change to make a floor pedal version of it? Do you know any on line store that I can get the items for cheap in Europe? Definitely waiting for more projects like this in the future. Thank you!!! Lots of my European friend order from Germany’s Bonzai Music (http://www.banzaimusic.com/). But these aren’t specialized guitar parts — you can get everything you need from any electronics supplier. I really want to make the #1 project but It needs more effort and time that I don’t really have right now. The volume drop isn’t an issue for me as I’m not switching between clean and distortion often. So how can I make the pedal version? Could you please make a nice scheme as you made above? Thanks!! Must agree…that’s a pretty cool one. It’s a shame the blending isn’t any better. Be sure to update us it you find a different pot value works better. Thanks for more great ideas! Very cool! I’ve seen the Black Ice & wondered about putting it in, but I like your super low-cost solution… I might do this to the Batman Logo guitar! Have you tried Ge diodes such as 1n34a? Might be a alternative to the Schottkys. It may give you too much of a voltage drop. The diodes Joe is using have a turn on voltage of .75 and 1.0 turn-on volts whereas Ge types run around 0.2 volt drop it may vreate a very low level output. Standard silicon diodes typically turn on at about 0.6 volts. You might also want to try 2 or 3 or even 4 or more Ge diodes in series rather than a single diode to get a higher turn on voltage, you could also do a mismatch which should give you an asymmetric clipping 2 diodes in one direction vs 3 in the other. This might also work with LED is you could find one that fired with low enough voltage. This would probably be very cool with active high output pickups. Usually Schottky diodes turn on at around 0.2V, and have a relatively low resistance once on. Ge diodes turn on around 0.3V, and the on-resistance is quite a bit higher. Standard Si diodes turn on about 0.7V. LEDs are all different beasts, and the turn-on voltage depends on the semiconductor material and the wavelength; the lowest turn-on voltage is about 1.6V and can go up to about 4V for some Violet/UV LEDs. Anyway, with Ge diodes (as compared to Schottky), they would start clipping at around the same voltage or just a little higher (making them just a little louder). Also, they would have a higher on-resistance, making for more of soft-clipped sound. Just a thought. Yep I misread the specs and I mistook the maximum forward voltage drop for the firing voltage on the links provided in the original post. I’ve never used Shottky diodes much in audio, my only experience with them was in chemistry instrumentation. Ge diodes I have used all seemed to fire around .2 volts or a little more when I used them as clippers but that was when they were after an IC or in the feedback loop for the IC circuit. I always liked the Ge diodes best in those circuits. The Ge diodes I use are all from my stash that I purchased in the early to mid 70’s from small electronic suppliers that were going out of business. So my Ge diodes are definitely the old school glass types many of which are fairly leaky. In any case it always amazed me that the best sounding guitar circuits sort of break the rules of electronic engineering. Back in the 1970s there were a couple of devices called Blue and Black Ice Cubes that plugged in the rear jacks in place of the reverb tank on Fender and other amps. It created a parallel distorted signal varied by the reverb control. They were basically diodes with a couple of resistors and capacitors that were also encased in plastic resin. Nils Lofgren used to use one on a Twin Reverb quite a bit back then to achieve his lead tone (according to his brother Tom who was in our dinner club). I usually figure that any circuit or device encased in plastic or epoxy is an embarrassingly simple design that the makers worry everyone will build themselves [Dumble amps ?] :-). I was curious about having this turned on and running through the buffer(to make up for the volume drop) then into either the distortion or the rangemaster. Is this a good idea, or would it get all muddy sounding? Well, the buffer wouldn’t change anything, but the booster/buffer from DIY club would. But honestly, I think it’s probably best to take this effect as it is, volume drop and all. If you want loud distortion, well, see my reply to DohminSemper above. I’ve actually built a few pedals using the Black Ice. The first one is based on the one that includes a switch to turn it on FULL. I used a 250push/pull pot & use a capasitor for humbuckers. It seeems louder then the single coil type. 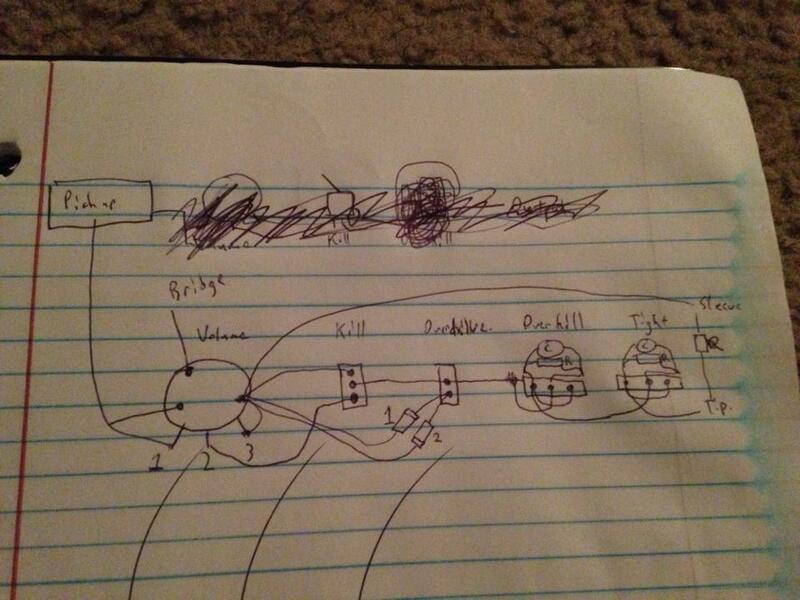 I basically used the same StewMac diagram, I added a 1 Meg Volume & kill switch. Ok – I know this is kind of counter to the original premise….but COULD we stick a battery in there? Totally! No problem putting a battery in there. But pragmatically speaking, it’ll sort of be like putting a battery in a cantaloupe. If I put a signal booster on when the distorted sound was there? Would that mess with the distortion, or just make it louder? Yeah, that would totally work. It’ll change the sound, in the sense that more level will be hitting your amp, and the tone will be more distorted than it would otherwise be. But it’ll retain the basic color. I have an original Black Ice – it’s a little black thing (with a serial number on it) with two rca male connections aligned to fit precisely into the reverb circuit of a Fender Princeton Reverb. It’s a little strange but its an ultra rarity that no one will own up to – but i suspect it was made by EHX. Actually I had three i gave two away to fender loving friends. it came in a box a bought in the 80’s along with 4 versions of Treble boost/Screaming Bird – i kept an original of that one too… very basic effects but they do the job pretty well. I’m amazed how some of the EHX effects have remained in my pedal chain – none which are newer than 1983. You could also try changing out just ONE of the diodes, e.g. use a Schottky on one side and the Ge diode on the other. That way your distortion will be asymmetrical, giving more even harmonics. I won’t go so far as to say “tube” tone. Now I did try putting a battery in a canteloupe, and WOW! what about just using 1 diode or LED? and how would you describe the difference in sound between a led and a silicone diode? will just 1 led mean less signal loss? Sorry, that just won’t work at all — you need to two diodes oriented in opposite direction to produce the effect. Also, while using different diodes is a cool way to customize the sound of a 9v-powered distortion pedal, only certain types of diodes work in this PASSIVE circuit. LEDs won’t work at all. There may be some other options that work here (maybe some of the electronics aces who read this site can help me here), but as far as I know, the effect you hear in my demo is pretty much the only option. Can anyone expand on that? Ok, you could use only 1 diode – but it would clip only half of the waveform. You would probably end up with a strong octave effect. The choice of diode dramatically impact the amount of clipping available. The clipping happens when the diode goes from being “off” to “on”. While off, the diode lets the signal go through unaffected. However, once the input voltage reaches the diode’s threshold voltage, it turns on, and doesn’t allow the signal to get any bigger. With active effects, you can boost the signal to allow diodes with higher threshold voltages to work. 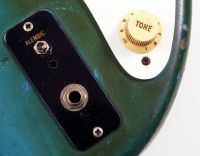 However, when using passive pickups, you need to have diodes with relatively low threshold voltages – otherwise they will never clip and never have any overdrive. If you look at the comments above, I quoted some specifications on other diodes. Also, there is a new version of the “Black Ice” available from StweMac. It can be found here: http://www.stewmac.com/shop/Electronics,_pickups/Components:_Black_Ice_overdrive/Black_Ice.html?actn=100101&xst=3&xsr=17287 This new version has four available configurations. Check it out! 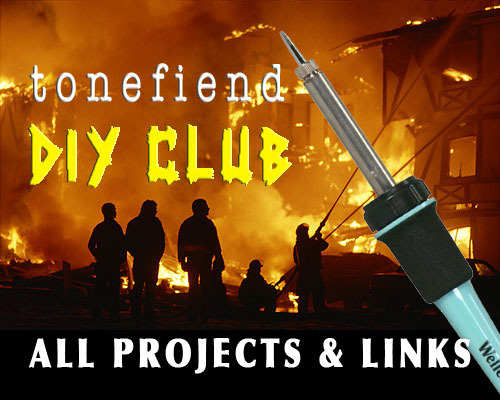 Today I added some clips over at my forum post about rectification http://tonefiend.com/tonefiend-forum/?mingleforumaction=viewtopic&t=85.0. A single diode will only result in half wave rectification and does not create an octave effect. It creates a strong second harmonic but it just sounds really distorted. That seems like a great idea. But how the two diodes add distortion? Could you please explain how this works? Also to make a pedal box that’s permanently turned on, what will I need? A metallic box, 2 mono jacks, cable and the diodes only? Well, what I don’t understand is where is the “ground”. Do I have to solder a cable from one side of the peftboard to the other and call it “ground”? 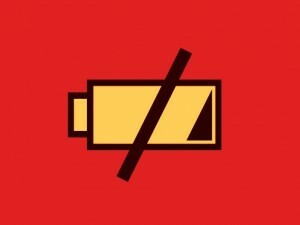 Is the negative side of a battery the groudn? Could you explain this please? Here’s my suggestion for someone putting in a diode clipper on their guitar: Use an SPDT center-off switch and get two different distortion sounds. 1) Put two identical diodes back to back from ground to one terminal. This creates a “thin” distortion sound. 2) Put two diodes with different forward voltages (e.g. a silicon and a Schottky) back to back from ground to the other terminal. This creates a “thick” distortion sound. The output level will be lower still than the “thin” sound so you’ll need to compensate for that somehow. You could run the guitar into a compressor or volume pedal to take care of the output level differences. I should stick to the forum, where I can edit my stupid remarks! If you start with two low voltage diodes like Schottkys, and then unbalance it by replacing one with a silicon or germanium diode, the result will be louder. Whichever combination has the lower sum of forward voltages is the quietest. Just wanted to drop a line to thank you for posting those diode “model numbers”. 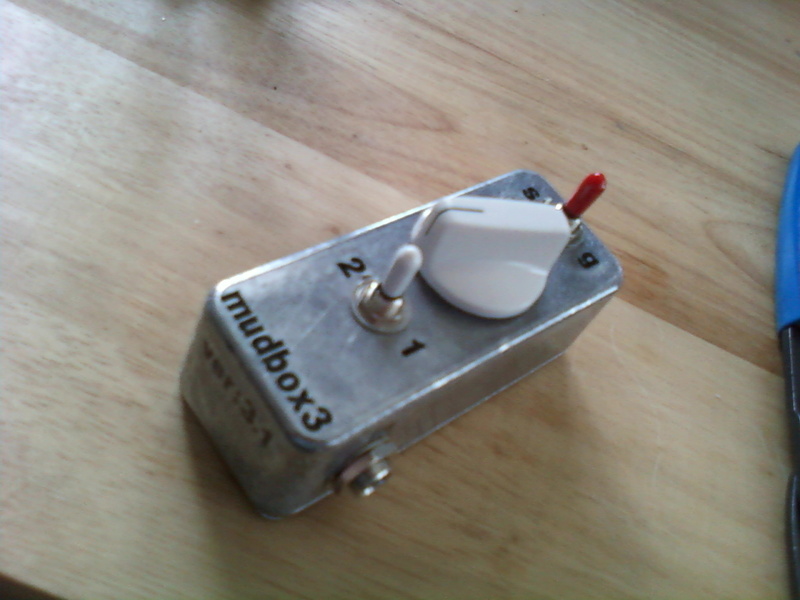 I added both to a tiny box I made so now I have an outboard pedal that I can select between the two types. The silicon diodes actually have no perceivable (that I can tell) volume drop compared to the germanium ones. 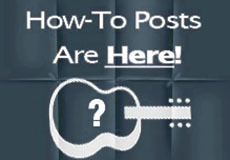 Cheers for this post…it was very helpful. Awesome! I’m delighted it worked out for you. Hey, me again. Trying this one in a bass. Running into some problems. 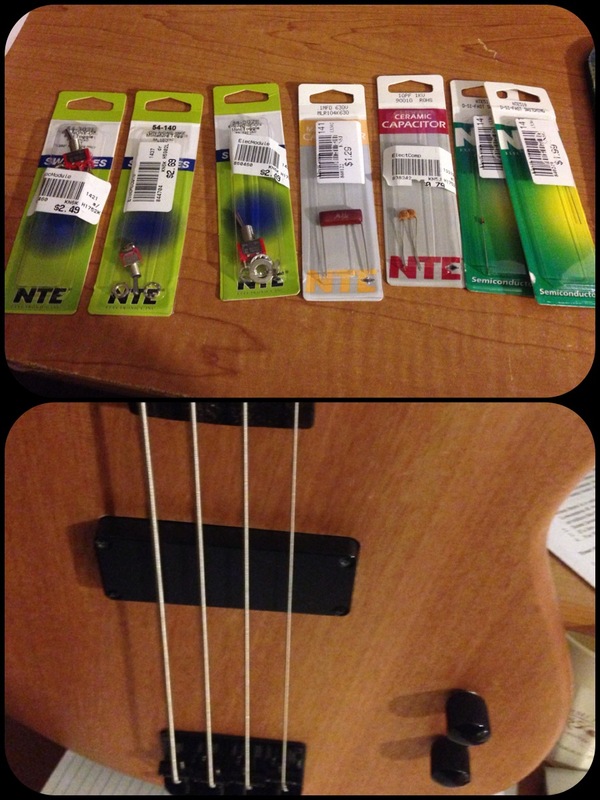 I’m trying to make a very weird series of mods to a bass with only a neck pickup. It’s a Dean Edge. I have the volume pot in and working, and after that is a kill switch. That also works fine. First would be a 0.1uf capacitor to roll off obscene amounts of highs (my self-dubbed “overkill” mod), followed by a 10pv capacitor on the next switch to roll off an obscene amount of lows. The point here is to try to get fuzzy synth-tones out of a bass using the various rolloffs, distortion, and kill switch. It’s an ambitious franken-project. After the kill switch, I’m getting nothing. I have signal flow to the amp, but the distortion doesn’t work and neither do the tone capacitors. I’ll post a rough sketch diagram. I’d love it if one of you could look it over and see if I’ve overlooked anything. From what I can tell, there’s no ground connection to your tone circuits. They look like an R and C in parallel and then this is in series with your signal lead. If anything this will provide a treble boost, depending on the load resistance. For a high pass filter, swap the location of R and C.
The kill and diode switches and connection do look correct to me. What types of diodes are you using? Gah! It took out my spaces. The capacitor and ground should be coming down from the wire between RESISTOR and output signal. I looked at the “Switched” diagram on the link you supplied. I see now there is an “R” hanging off the end providing a load for the final treble boost at any rate. What value components are you using? It’s also possible that you cannot achieve your specific goal of combining two passive filters directly together because one affects the other. I don’t mean to say that it is impossible, simply that you would need to take the loading effects into account when choosing the component values, or add a buffer between them, which seems counter to your battery-less goal. My suggestion for debugging would be to build/check one section at a time, using an alligator clip lead to avoid soldering. I actually ended up deciding that the diagram in the link I gave was crap, and applied some recently attained knowledge of the basics to figure out how to get the two components to work that do currently work. For example, in the diagram with the switchable tightness control, there is nothing going to ground. 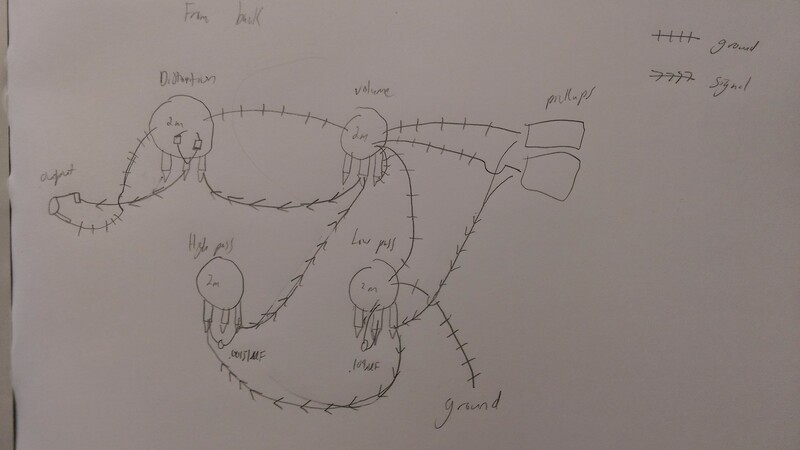 I did it their way, drew my diagram above, then when nothing worked I posted it here. Then I started thinking about what was happening. A tone cap sends signal to ground, but i wasn’t sending mine to ground. So I dismantled and started over. I went from the pickup to the volume pot lug 1 and ground, out from the volume pot on lug 2 to the center post of the spdt switch I was using for my kill. Tested it, and it worked. So then I thought about how a tone pot is basically just a shortcut to ground through a capacitor. 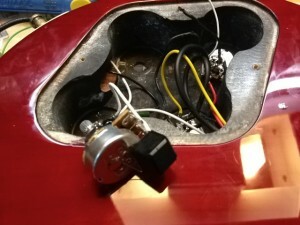 I put a wire on lug 1 of the volume pot going to the center lug of the spdt switch I was using for the tone switch. I put the 0.1uf capacitor on lug 3, and sent the other end of the cap to ground. But as stated in reply to Joe below, I’ve got some more reasearch to do to figure out why the diodes aren’t working and why the 10pf cap isn’t trimming off bass. So I’m back to the drawing board on how to wire those up. I woke up because the screen door was banging in the wind, then I got a leg cramp! I’ll get back to sleep in a bit (I hope). Meanwhile… it would help to start by having a specific goal in mind frequency wise. Also, I can tell you up front that using RC filters is not going to give you a “synth” like filter sound. Pardon the upcoming math. It is simply how I think and my hope is that if I am unable to communicate, perhaps someone with better grounding in the real world can assist. Anyway, the fundamental frequency of bass low E is 42 Hz (cycles per second). But, strings have higher harmonics that can be heard, for example, when you slap the string, or pick with a Fender heavy right near the bridge. Every octave that you go up doubles the frequency. So two octaves up is still only (42 x 2 x 2) = 168 Hz. From what I gather about your sonic goal (a synth like sound), this tells me you want a fairly tight (small) bandwidth. So, start by choosing the NOTE on the bass that you want to be most prominent. Notes above this will roll off at (decrease) 6 dB per octave increase in frequency. That’s what a typical one cap tone control sounds like cranked all the way down (though where that corner frequency is depends on your component values and pickups). I’m assuming that you want more high end than you would normally get when you have the tone control all the way down? No, the synth sound comes from the combination of the capacitors and the distortion on my amp (a Line 6 Spider III’s insane channel…the 0.1uf cap through that really sounds like a square wave synth, I was quite surprised). So I’m aware that the cap alone won’t do the synth sound. Also, through a clean channel with some chorus and delay, volume swells with the 0.1uf cap in the chain sound like a synth too (I got this new product called a VKnob and it makes this process much more fine-tunable). Again, well aware that the synth tones will come in post, but the caps will help me shape it going in to get those tones in post. I used the PTB wired double fat strat with volume swells to simulate a synth for an ambiance record on a meditation CD for a client who is working in my studio right now. It was really cool. What I’m looking for is the 0.1uf cap to roll off the highs to an absurd level, then an equally absurd smaller cap to roll off the lows on a bass to help me thin it out when desired. The combination of those two filters with an onboard distortion, in theory, will let me shape the tones through the post processing to get even wackier tones, and the distortion circuit would act like a square wave reinforcement in theory (one reason I’m not worried about the volume drop, it’s likely to already be going into a very distorted signal, so the volume drop won’t be much of a concern). Add to that the ability to get staccato voicings using the kill switch, and the volume swells using the volume pot to simulate pad swells when desired, and this seems like a very cool approach to writing some industrial metal tunes. So that’s what I’m going for, if that helps to clarify. Hi again Brandon, I looked at your link and see you have some sort of recording studio? Or you’re really good at Photoshop 8^). Anyway I would recommend trying to design your equalizer frequencies though experimentation with equipment you already have prior to buying components and soldering them together. In this case, if you have a graphic equalizer, I’d run the bass (possibly through a distortion pedal) into the EQ and then turn down bands on the high and low ends (don’t boost anything in the middle) and see if you can get to the sound you are after. If you can, then you could use the band frequencies at the edge of the center zone which isn’t being cut and use these for the corner frequencies of your bandpass filter. Keep in mind this will just be an approximation of what you would achieve with an RC bandpass filter, but it would help you determine whether it’s even worth the effort. The main thing to understand about a passive RC bandpass vs. a synth type filter is that the RC is not “resonant” and won’t give you that real accentuated peak at the center frequency. I do own a studio, but not the one I’m pictured in on my web site. 😉 that said, all I’m looking for is something that will work as a switchable low cut filter for the bass that I can wire in with the switchable high cut filter I already have, as well as a working diode distortion. The rest of the synthy tones I come up with in post, I just need to know how to get the low cut and diode distortion to work in my circuit. The ptb wiring mentioned on this site worked well on two guitars I’ve wired. I just can’t seem to get it to work on an spdt switching configuration instead of a potentiometer. furthermore, I don’t necessarily have a specific sound in my head I’m trying to go for, it’s more of a “hey, what would happen if I did this?” kinda frankenstein project. http://youtu.be/AiHvrrB8Q5k – a quick youtube vid shot on an iPhone 5C of me sloppily playing one handed bass lines through the insane channel of the amp, with the 0.1uf capacitor switched on…not set up to be synthy here, more of a bass lead sound. It has some tremolo on the channel, and a mild delay, but mostly it’s about how much sustain you get from that channel of the amp with the neck pickup of an instrument through the 0.1uf capacitor. It flattens it out, and the intense distortion compresses it and makes the notes able to go on forever (almost ebow like). I spend more time tweaking that, add in the fuzzy diode distortion, I’ve probably got a filthy square wave on my hands (I’m a fan of filth) that would not sound like a bass. Add the ability to cut some of the lows at the flick of a switch, a good long delay time, and some rhythmic kill switch timing, you’ve got a really interesting bass sound that doesn’t sound much like a bass. OK I think I have figured out the main problem. If you want the first filter to roll off a lot of highs, it needs to be configured as a low-pass or bass boost. 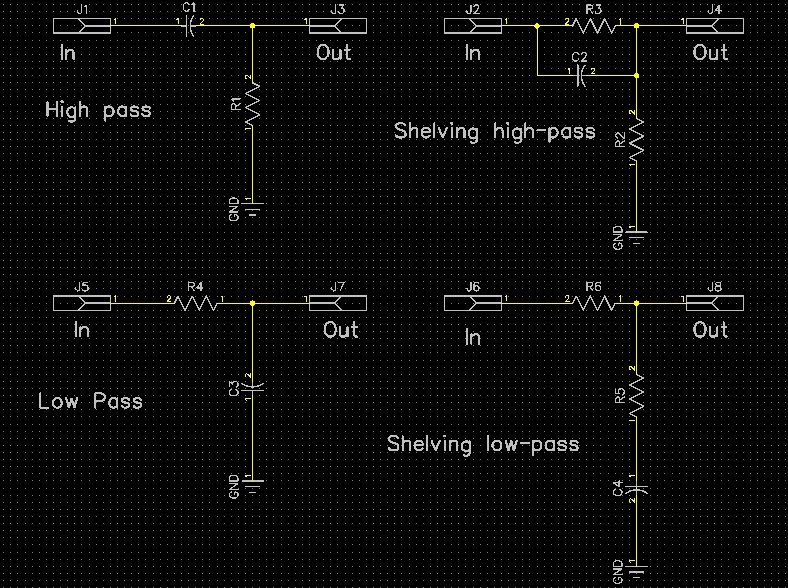 Check the image supplied for basic circuits for low pass, high-pass, and bass and treble boost. I am happy to explain how these work or help you figure out how to select component values, if you like. In other words, ANY information you are willing to freely give me to help me figure out what I need will be appreciated and not fall on deaf ears…or eyes…or whatever the internets equivalent is. I’m gonna go check out the link you sent right now. Thanks a lot for the help. The squiggly thing is a resistor. The thing that looks possibly like a hi hat is a capacitor. Thanks for stepping up, Shizmab! You answered better than I could have. I’m watching this project with interest! And I hope you’re not taken aback by the way the passive diode distortion (AKA Black Ice) induces a volume drop. We’re so accustomed to distortion adding volume that it’s a bit unnerving when it has the opposite effect. I imagine you can TOTALLY get great sounds from this setup, but I hope there are no unpleasant surprises. I too have been thinking about all-or-nothing, switch-based tone controls — like a dumbed-down version of the Stellartone Tone Styler. I think could work great for many players, whether they realize it or not. I can easily imagine getting by with three settings: wide-open (bypassing the tone caps), some small cap (for just taking a bit of edge), and a cap between .022uF and .047uF for a dark, rolled-back tone suitable for EBow. That’s a pretty interesting idea. I think that one reason the Stellartone offers six, ten, or eleven settings is not so much that each one of these settings will be useful, but simply that the resonant peak (and rolloff) frequency is set by a combination of the cap (which Stellartone supplies) and the pickup’s inductance (which they don’t). So “how it sounds” depends a lot on your pickups. For any given guitar you’d want to choose the cap values experimentally (by ear, that is) before committing to solder. Since putting pickups in parallel and series changes the resulting inductance quite a bit, different pickup settings would also result in different peaks. It’s not at all like running your guitar through a fixed equalizer. Been a busy few days, during which I neglected to check back here. But I tried it, and only half of it worked. I have a 0.1uf capacitor on a toggle where the tone control was, and a kill switch. For the life of me, I CANNOT get the diode distortion to work :cuss: (indicating that I need to do more research into how diodes make distortion and whether or not I actually did buy the right kind from Micro Center or if I need to go shopping again…and don’t ask what I bought, the package got lost and I have no idea…Hi, I’m a noob! Nice to meet you! ), and the 10pv capacitor did nothing. I’m going to assume it’s a flaw in my diagram, as I did the PTB on my Squier double fat strat and on an Epiphone SG with success. But, as stated…NOOB! Shizmab Abaye, I haven’t yet read through your replies, but am very interested in what you have to say to see if there is anything in there that will help me accomplish what I want to here. Thanks a ton for your time trying to help me with this. 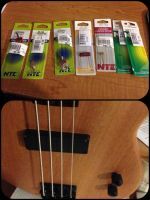 I’m including a picture of the bass, alongside the components I bought, for anyone interested in what I’m working with. I’ve already got a couple of sound samples of the current working order of the bass on my band’s instagram (look up @projectdivide – little video clips are in there). I’ll get back to researching to see what it’ll take to get this to work, and post the results here. Thanks guys. Would you be able to post an updated drawing of your existing circuit showing the component values, and/or resistor color codes? Then I’ll have a better idea of what’s really going on. Here’s the drawing…and you’re right, confusing all over. Let’s just keep it all on this one then? This is the drawing after I sealed it up a few days ago, as I haven’t had time since seeing your responses to try anything new yet. The only resister in here as of right now is the volume pot, and I’m sending the 0.1uf capacitor to ground (which wasn’t part of the drawing on the original link I posted, which is one reason it didn’t work. Would like to know how to add another tone toggle to this that would roll off lows (like the PTB circuitry) and how to add the diode distortion. Could not get either of those to work. OK, here’s my back of the napkin suggestion. Place the cap in question BETWEEN the hot lead from the pickup to the lug of the pot where it currently connects. So the pickup hot lead won’t be connected directly to the pot any more. The cap values below are calculated, but mostly aren’t easily available values. Use the closest available value and for sure, dial it in by ear. I started at 84 Hz which is one octave up from low E and went up by octaves from there. Anyway as you can see, each time the rolloff frequency doubles (goes up one octave) the cap value is cut in half. To bypass it, put a switch across the cap. If you get any popping when switching in or out, put a 10 Meg resistor across the cap. By putting the cap before the pot, how would I get a switchable cap? I’m not understanding? I want it to be not hardwired in, but toggle switchable. Thanks for the info on the frequencies of specific caps. That will help in picking a different cap. It could be the cap I was using was just too small for the job. FYI, it’s a 500K audio taper pot. Put the switch across the cap (shorting it out when turned on). Well I’ve contacted my alma mater for a refund. My calculations neglected to include the effect of the 0.1 uF cap. Without the 0.1 uF cap switched in, the frequencies will be accurate. With it switched in, the high pass frequency will shift much higher and the output will be pretty heavily attenuated. There is a way around this, but it would involve putting resistors in (such as the RC bandpass I gave you the link for). Ok, so I’m headed back to the electronics store to see if I can get the right diode (I’m betting I got the wrong kind). Will report back if it works. Meanwhile, discovered the Blower Switch mod, and am adding that to a guitar this morning! Going to try to pick back up the bass experiment tomorrow after looking into my diagrams again. Will post results if I can find the time as I plan to. You said Stellartone I am interested? BTW should be getting the 335 build back soon (screams for a varitone) it needed fretwork sent it to the master luthier. Can you prove by a video? The videos I've seen are about the black-ice. so if a resitencia if possible so that it will some power but the diodes themselves is impossible. Greetings! Thanks, Cygnus! Glad it worked. But sadly, you need to add a battery to make the LED illuminate. Dang… I thought that would be the case. Oh well, thanks for the quick response! I’m thinking this time around I’m gonna make a custom jack plate and add the switch on it, like the Stratoblaster design. Hell, might add a Tele bridge and go for the ‘Lowell George’ look (minus the dungarees). Sorry to bug you again, Joe. I tried the Black Ice wiring with a pot (from their PDF instructions) and Schottky diodes. I can’t notice any changes though. 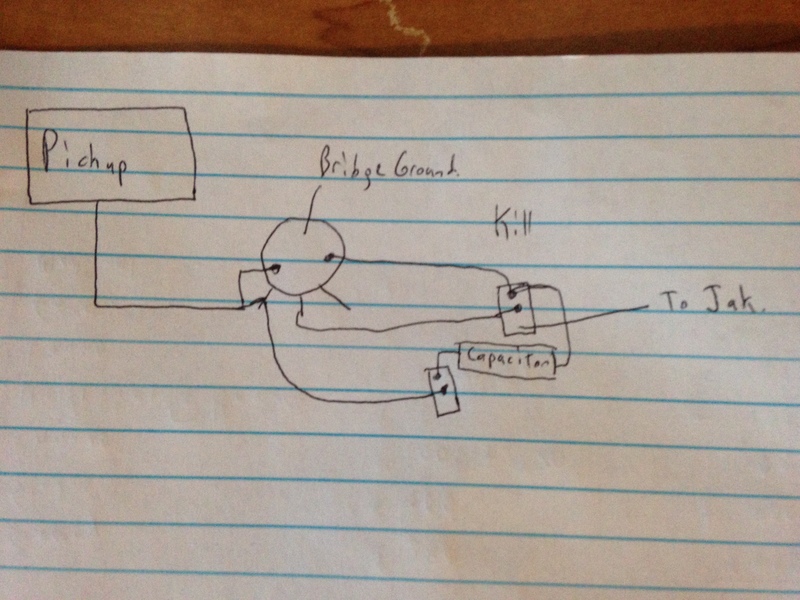 I’ve mocked up a quick schematic for it to work like your SPST switch. Just wondering if you reckon it’ll work? If not I’ll just get a latching SPST button and cover it with a tone knob (it’s on another Strat, just want to keep the ‘original appearance’). Dudo que funcione, y, si es así, ¿por qué no subes un vídeo con esos diodos y no con el blackice? Andrea Coletta I did what you mention Pepe Kaos and does not work. What kind of resitencia use? the “black ice’ control for amps if memory serves was two rca plugs, with a 47k or 470k resistor (can’t remember which) soldered to the two tip connections. that’s IT. what it does is use your reverb as an overdrive, complete with a fair amount of transformer saturation. kinda like blending a tube overdrive in parallel with your signal. real easy and kinda neat. will work in almost any tube amp that has a reverb transformer. Hey Jimi — how’s it going? Wow, I never even heard of that mod. Do you have links to any audio examples? Thanks for sharing! This project still working, man ?? Actually a pair of back to back Schottky diodes clips at around 400 to 500mV peak to peak. As long as the pre-amp you use can manage greater than this signal level (it is likely it will) you will get some clipping distortion. You may want to fit a resistor in series with the diodes (maybe 1K, although the pre-amp may already have an output isolation resistor of anything between 470 ohms and 10K to stop instability when loaded by instrument cable capacitance) and take the output between signal ground and the junction of the two diodes and the resistor. It is probably going to sound a bit scratchy unless you roll off the treble. Thanks for the quick reply guys. 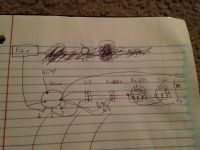 Now, I see in the diagram joe drew an on on switch, well I’d much prefer a knob instead, not a switch guy.. Would I simply take the ground and signal out from the circuit and solder it to a pot and that to a jack? It doesnt have a ground, not that I can see, but the cable that leads to the jack has a red, black and white(?) wire. And while I’m at it, I’m wiring up a guitar to have a knob to cut treble, and another to cut bass. I’m following this schematic with 500k pots and .104 uf caps. The bass cut isn’t working, is that a problem in execution or is this model flawed? If you look at Joe’s original post on the PTB you will see that the values of both he pots and the capacitors for bass and treble are quite different. 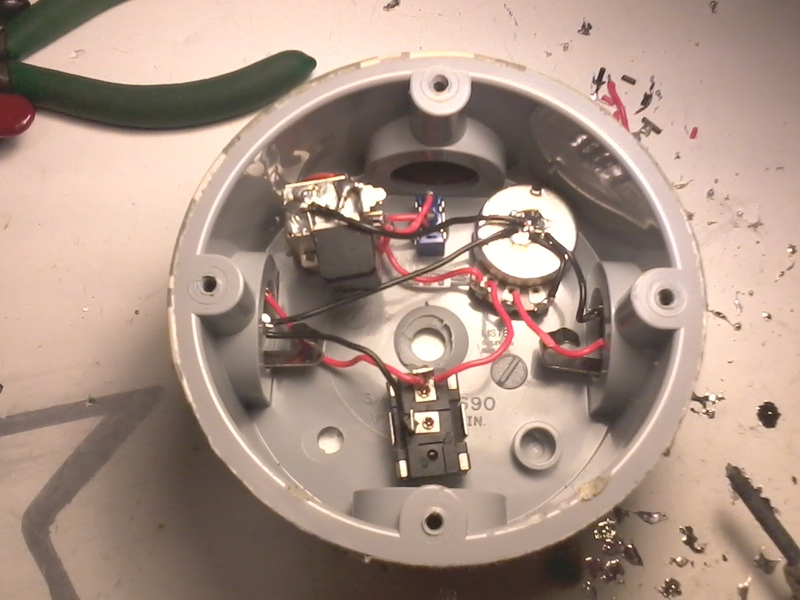 The bass pot needs to be a high value and the capacitor quite small. Joe used a 1M pot and an 0.0022uf for the bass. Without the cap, the bass pot at maximum value needs to be large enough to attenuate much of the signal. The capacitor allows the signal to bypass the pot, but because of its relatively small value only the highs get past, while the lows are still blocked. To start with just try making the bass cap 10 times smaller in value. One-tenth the value is a good starting point. I just did a short Premier Guitar column on this idea (posting in about four weeks) where I pointed out that the .002uF cap is one-twentieth the value of a typical .047uF tone cap — or, like Terry says, one-tenth the value of an equally common .022uF. There’s no perfect number — it’s a matter of taste. But a .002uF and a 500k pot work great for me. (Yup, a 1M pot is fine too.) For more bass cut at the maximum-cut position, step down to a .001uF. For less maximum cut, try a .003uF or .004uF. I’ve seen people use resistors in addition to the cap on the high pass knob, should I do the same? I didn’t trace it all out, but there’s nothing on the middle lug of your high pass pot, which is almost certainly a mistake. 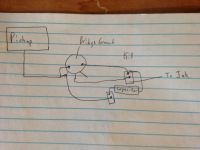 I don’t know if the comments on this old post are still checked, but I was thinking about a passive distortion circuit in my new guitar wiring. Would it be a good idea (and even possible ?) 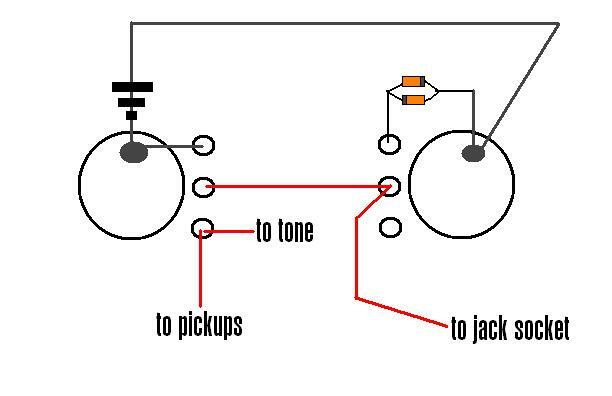 to have a single 2-way switch (I’m thinking about the rythm switch on my Jazzmaster) which both activates the diodes circuit and puts the pickups in series, which if I’m not mistaken increases the output of the guitar ? 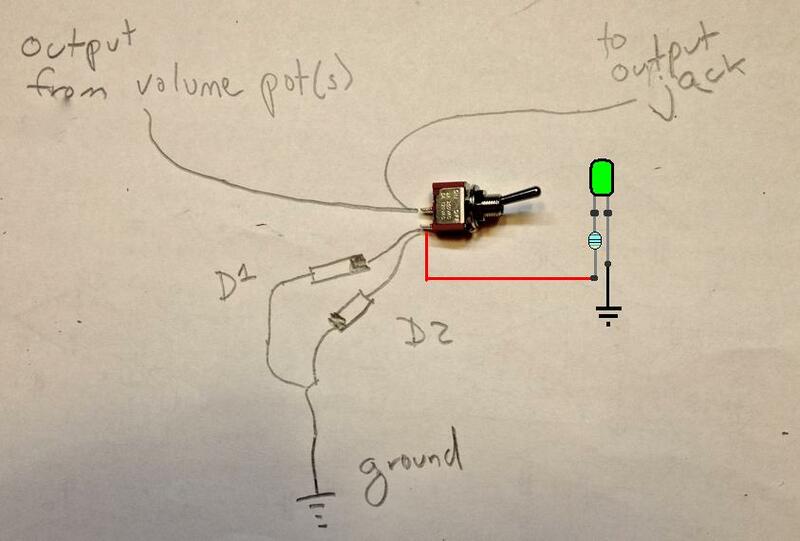 This looks like a way to get less volume drop with the diodes, but maybe I’m wholly mistaken ! 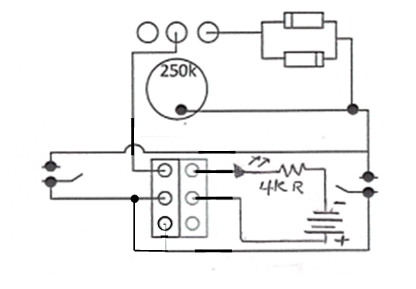 All diode distortion, active or passive, limits the signal swing to that of the forward voltage drop of the diodes used, holding volume to, or below, that fixed level. That is why guitarists often speak of distortion pedals offering more or less ‘compression’. The forward voltage drop varies a little for different models of diode within the same technology, but very roughly speaking you can say something like; Schottky diodes Vf = 0.2volts, Germanium diodes Vf = 0.3 and Silicon diodes Vf = 0.6volts. So for a pair of back-to-back Schottky diodes the signal is clipped to 0.4volts peak to peak, for Germanium to 0.6volts and for Silicon to 1.2volts. This is why only Schottky diodes are used in built-in-to-the-guitar passive distortion circuits since the maximum output from passive guitar pickups is only just enough to produce usable clipping. If you use Germanium or Silicon diodes you likely won’t hear any distortion at all. This also to large degree why the different types of diode produce different sounds when inserted into the same active distortion pedal circuit. If the gain of the diode driving circuit is adjusted to produce the same degree of clipping then the different diode types all start to ‘sound’ similar. Most (all?) distortion pedals that provide switching for different diode types do not include any gain normalization to drive each diode type to the same degree of clipping. Or any gain compensation after the diodes to normalize signal level. Once driven into clipping, Schottky diodes produce a smaller signal and therefore sound quieter than Germanium and then Silicon. Driving diode pairs with a larger signal simply makes the distortion sustain for longer, it does not make the signal out of the diodes any louder. I had to re-read some parts, but I think I get it. Since I’m increasing the output of my guitar with a series mod (I don’t know by how much), is there a kind of passive circuit that would clip this louder signal to an output that would produce some usable clipping, and getting it in the ballpark of a ‘normal’ guitar output ? Sorry if this is vague, I have already some difficulty wrangling these concepts in French, and this isn’t easy to write about in English. But thanks for this thought-provoking answer ! Well Flürk, diodes are relatively cheap, although it might take a bit of hunting around to get samples of all three types – Schottky, Germanium and Silicon in small signal format (diodes designed for higher current may have more forward resistance and voltage drop, forward voltage for Schottky diodes in particular seems to vary a lot by model). Ebay might be your friend in this case. Anyway assuming you can get hold of some sample diodes, why not experiment? Lift your pick guard and just hang the bits on a piece of perfboard onto your guitar with croc clips. With high output pickups in series you might get a result you like with Germanium or even Silicon. I suppose also if you wan to stay with a passive circuit inside the guitar you might try a small audio transformer. The type you used to be able to get for small transformer coupled transistor amplifiers, to boost the signal level. Although most small audio transformers of that type will probably load the pickups somewhat and reduce treble (perhaps desirable in a distortion circuit). 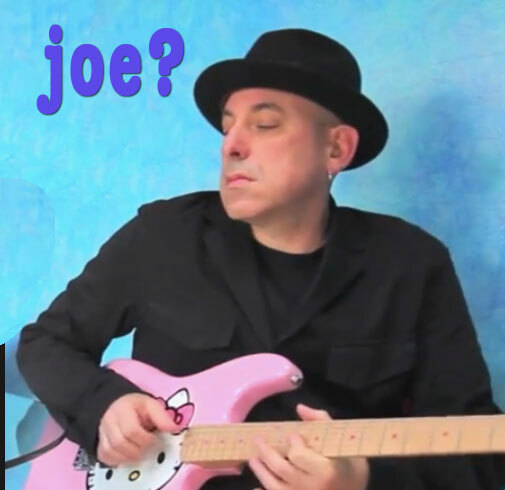 And thanks again Joe for the articles and video, this blog has proven priceless in the last few years of experimenting with guitar-related weirdness ! Per usual, Terry has jumped in with a better response thannI might have managed. I think the dual switching you propose SHOULD be doable with the right multi-pole switch, but it would involve some pickup selector wiring wizardry that I’m a little to groggy to contemplate. On the other hand, if you like the sound of series-arrayed pickups (I usually don’t, but a lot of players far better than I disagree), you might prefer two separate switches so you have the option of series WITHOUT the distortion. (That is, use a push/pull pot to activate the diodes, and wire your selector so that series is one of the options.) But Terry confirms with facts what I’d have said based on a vague hunch: You’d get different tones from the diodes with more output (plus the basic tonal difference relative to parallel), but it wouldn’t mean an increase in distortion volume. Built it as a stomp box and added a circuit for an LED to indicate the effect is engaged. I’m looking to do this with a couple Schottky diodes on a PJ bass setup with 2 vols and 1 tone. I have two little SPST switches because I like the idea of dropping it in and out rather than gradually rolling them in. Any help in understanding this is greatly appreciated. Well, just answered my own question, I didn’t realize the single pole lug on the switch was constant and when you flip the switch you just add the other throw…. Hey joe i have a strat with 3 single coil pickups and i cant seem to find a wiring diagram to get the diodes in place so if you have any tips or photos please let me know and what im trying to do is instead of adding another ill just use the middle one for the diodes.